MANILA, Philippines ? On the last few days of the budget committee hearings, a debt watchdog has asked the House Committee on Appropriations to follow President Benigno S. Aquino III?s example by suspending interest payments for ?corrupted debts and deals? in the proposed 2012 national government budget. The Freedom from Debt Coalition (FDC) stressed that the move will bolster the drive towards more efficient infrastructure spending in the future. “If the President himself is willing to use his political capital to suspend anomalous debt-financed deals, I cannot see why the Congress will not be able to hold its other end of the stick and withhold payments for these deals until they are investigated or renegotiated”, said FDC vice president Emmanuel Hizon. Hizon cited Aquino’s recent move to renegotiate the controversial North Luzon Railways Project, which cost ballooned from $421 million to $621 million from cost-overruns and had been the subject of numerous Senate investigations by Senator Frank Drilon. Other questionable debt-financed projects have been cancelled, including the P18.7 billion ($430 million) Belgian-funded Laguna Lake dredging project and P12 billion ($276 million) French modular RoRo ports. “We know of the good track record of Committee on Appropriations Chair Joseph Abaya, and we are sure of his capacity to implement such a breakthrough reform if only he will be willing to,” Hizon said. Hizon said that the practice of suspending interest payments for questionable debts goes back to 14th Congress, but has been continually vetoed by then President and now Pampanga Representative Gloria Macapagal-Arroyo. “At that time, Arroyo had been a huge obstacle to justice by continually opposing this House measure, fearing that the subsequent investigations will eventually uncover more of her questionable debt deals, more of her NBN-ZTE’s and Northrails,” Hizon said. “Ang paggugol na matuwid ay ang hindi pagpabayad sa di makatarungang utang. (Proper spending is when you do not pay for unjust debts,” Hizon concluded. MANILA, Philippines – The petition of National Power Corporation (Napocor) and Power Sector Assets Liabilities Management (PSALM) seeking to recover stranded debts and contract costs amounting to almost P140 billion or equivalent to 40 centavos per kilowatt-hour through the universal charge (UC) should be denied by the Energy Regulatory Commission for lack of merit and substance, according to the Freedom from Debt Coalition. 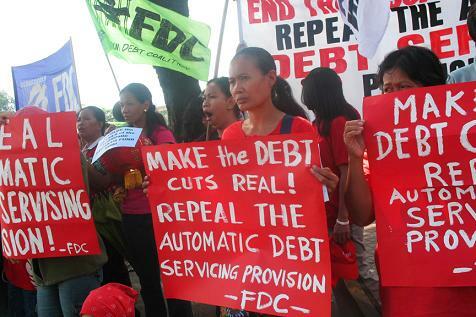 In a protest action outside the Ortigas office of the regulatory body coinciding the public hearing on the said petition, FDC members from various communities and Youth Against Debt brought giant “scissors” demanding cuts in electricity rates in the country, which, at present, has the highest residential power rates in Asia at 24.566 US cents per kWh. The group also brought a giant paycheck illustrating the latest total debts of Napocor and PSALM, amounting to P729 billion ($17 billion, P42:$1) under the account name of Juan de la Cruz. They then cut up the check with scissors, symbolically rejecting the huge debts intended to be passed on to ordinary consumers in the next 25 years. FDC claimed that PSALM is “hiding behind small numbers” because the agency’s “true and cruel intention” is to pass on the entire debt to ordinary consumers. The group added that raising awareness about this issue among the public is vital. PSALM is mandated under Republic Act No. 9136 or the Electric Power Industry Reform Act (EPIRA) to calculate the amount of stranded debt and stranded contract costs of Napocor. EPIRA defines stranded debts as any unpaid financial obligation of Napocor that has not been liquidated by the proceeds from the privatization of its assets. On the other hand, stranded contract costs are those excess contracted cost of electricity under eligible contracts over the actual selling price of the contracted energy output of these contracts in the market. In their petition, Napocor and PSALM seek the approval of stranded contract costs portion of UC in the amount of P74.298 billion to be imposed at the rate of P0.3666/kWh, and stranded debts portion of UC in the amount of P65.019 billion at the rate of P0.0313/kWh. 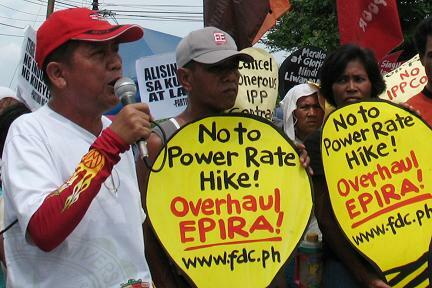 The petitioners seek to impose these additional rates to customers of the Luzon, Visayas and Mindanao grids. They await the issuance of provisional authority in order to start charging electricity consumers with these additional rates pending approval of their petition. Job Bordamonte, FDC power campaign coordinator, said that privatization of assets held by government-owned entities – in this case Napocor – “strands” certain costs. This is because obligations incurred in pre-existing expenses/debts pertaining to acquisition and maintenance of those assets would have been recovered by Napocor through its return-on-rate-base (RORB). “But these could no longer be recovered when the assets were sold to private entities and could no longer be operated by Napocor for electricity-generation,” said Bordamonte. In its intervention, FDC cited a paper by William J. Baumol and J. Gregory Sidak published in the Harvard Journal of Law and Public Policy (Volume 18, Number 3, Summer 1995), explaining that these costs represent expenditures incurred in the past while meeting its obligation to serve all customers within the area in which it holds an exclusive franchise. “However, the entry of competitors who are not burdened by such inherited expenses can prevent the utilities from recovering those costs,” FDC said. The ERC has denied PSALM and Napocor’s first petition on 15 November 2010 due to their failure to substantiate their application for proposed rate increase. The original amount of the said application was P573 billion for stranded debts while stranded contract costs was around P22 billion and P26.865 billion. FDC was one of the many opposed to the said application. However, FDC has learned during the budget deliberation last August 9 at the Lower House that PSALM’s most updated debts continue to surge, amounting now to $17 billion or P729 billion (P42:$1). FDC believes that a series of applications is still being worked out by PSALM and Napocor until the entire amount is paid for by consumers. In addition, FDC said that the petition on stranded debts tends to lump all types of Napocor losses together to be paid for by electricity consumers through the UC. “This opens the door to double recovery for Napocor, such as actual and/or constructive recovery through its regulated rates and recovery through the UC,” FDC said. FDC said that despite the EPIRA’s formula of selling government assets, imposing various additional charges, and assuming P200 billion of Napocor debt, the debts of Napocor and PSALM continue to balloon while the lives of ordinary consumers have worsened in the last ten years under the EPIRA law. FDC said the present administration must acknowledge that this is no longer a business-as-usual approach in relation to the issue of ever-increasing power rates which are being left alone in the hands of ERC commissioners.